The verse above has been engraved on a rock outside our front door for many years. We are on the second rock, the first one broke in the move before last. We have not changed our beliefs nor have we changed our allegiance – we just got a new rock. I saw the rock with the verse at a flea market, although most folks I know would call Canton’s First Monday trade days more than a flea market. 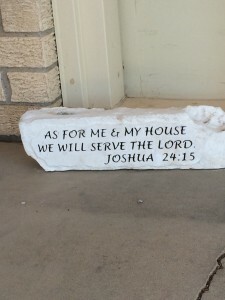 I saw the rock with the verse and knew I needed it at my front door. I needed it for a couple of reasons. I needed it to remind me of who I was and what I purposed to be. And I needed it so that any who entered my house would know what we were about at our house. The rock is placed there on purpose. It is not for show. It is to remind me and all that enter that we have a standard to live to every day. If you come as a friend, then it should both challenge you and encourage you. If you come as a visitor and you see the rock, then it gives you permission to hold me and my family accountable. And hopefully, if you come not knowing Jesus, it gives you a pause to ask me about the rock and the verse. As leaders we have to know what we believe. And our actions must live out those beliefs. My friend Ralph and I were discussing various sermons and styles of preaching. We were in complete agreement that every sermon should end with an altar call. For those of you who may not have grown up in the Baptist church, an altar call is what Robert’s Rules of order would state as “calling the question”. An altar call is giving the folks in attendance an opportunity to ask Jesus to be their Lord and Saviour. It is also serving the same function as to call the question – which is a motion to end the discussion and make a decision. I have not suffered persecution for my beliefs. Oh sure, I have been threatened. I have had folks show up at my house more than once with the purpose and intent of whipping my tail end. I have had my cars vandalized. I have had powerful people threaten to ruin me. I have had cars in my drive late at night with the purpose of intimidating me. I have had folks in public meetings threaten to have me fired. I have been forced to leave more than one job because of my beliefs. I have been harassed at church, yes you read it right, I have been harassed at a Baptist church in Texas for my actions – actions which I believe reflected my belief in Jesus the Christ and His teachings. But I have never really been persecuted. I have been privileged to go to India and serve on a mission team for the past 4 years and the Good Lord willing I will go again. 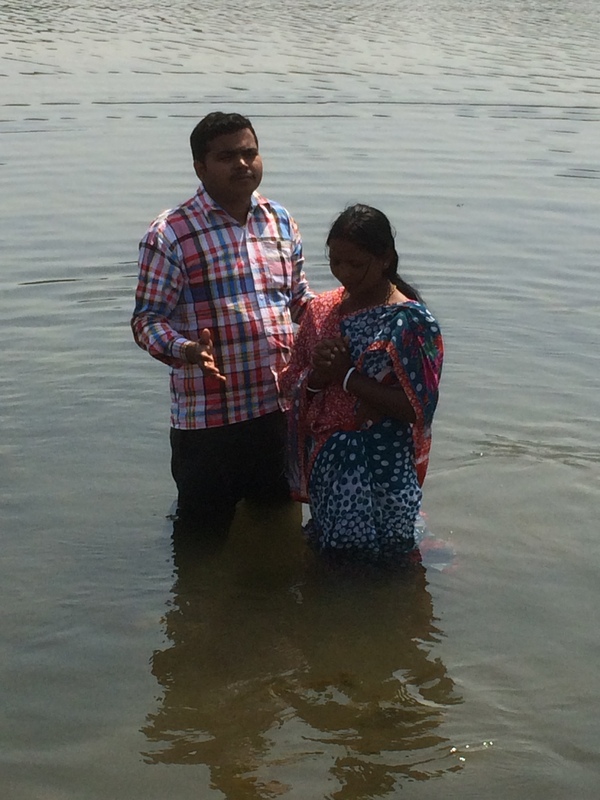 Our purpose is to serve and to introduce the folks we met to Christ, to represent Him. The Staurolite foundation sprung up as a result of the Good Lord’s leading during and after the first trip to India. The Staurolite foundation provides support for the New Hope school. A school located in a slum on the outskirts of Kolkata, India. During one of our times in India, we visited a house in a slum where children gathered for bible study a couple of times a week. By house, I mean a dwelling about 12 foot by 12 foot. The house had a bed/couch, one light, and a fan; it was home to a family. Most importantly in that country, where Christians are truly persecuted, there by the front door was a cross imbedded in the wall; yes that is the picture above. While I have a rock by my door – these folks imbedded a symbol of their faith in the wall by the door. Now these folks, they are likely to suffer persecution. 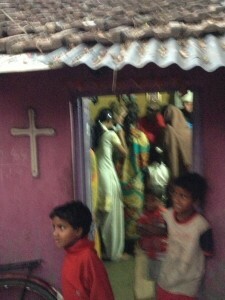 They were the only Christians in their neighborhood. They live in a place where Christians are persecuted, and if what I read in the press is accurate with the new leadership of the country, Christians will be persecuted even more strongly in the future than in the past. I know when we are in India we have to be very careful what we say. I am continually reminded to speak in guarded terms. For example, a baptism is called a swimming event, we talk to the CEO instead of praying, and we talk of the Father instead of Jesus or God. But these folks, with strength and courage, and fully counting the cost, posted the cross representing Jesus by their door. I have been writing thoughts on leadership in another blog for a while now. I has truly been my pleasure. I intend to continue. I would be remiss in not following my own critique of others by stating we should always and clearly state our beliefs. State clearly whose we are and what we are about. So, let me put down for the record. I am a follower of Jesus the Christ. He has brought me to where I am. All I have and all I am is due to Him. If you are interested, I would be glad to introduce you to Him. Will knowing Jesus make your life easier? – probably not. Will it make you richer? – probably not. Will it give you assurance that it will all work out in the end? – without a doubt YES. 4) Once we receive Him our debt is forgiven Therefore there is now no condemnation for those who are in Christ Jesus. (Romans 8:1 NASB) 5) The way to receive Christ is to ask for “Whoever will call on the name of the Lord will be saved.” (Romans 10:13 NASB) that if you confess with your mouth Jesus as Lord, and believe in your heart that God raised Him from the dead, you will be saved; for with the heart a person believes, resulting in righteousness, and with the mouth he confesses, resulting in salvation. (Romans 10:9, 10 NASB) Prayer – there is no perfect wording that is required for salvation. All that is required is as it says in Rom. 10:9-10, that you confess with your mouth that you are a sinner, believe in your heart, and your belief will result in righteousness. “Jesus, I believe/agree that You are the son of God. You came to earth to save me from my sins and give me eternal life. I ask you to come into my heart and life and forgive me for my sins.” Another Prayer Dear Lord Jesus, I know that I m a sinner. I do believe You died for me. And the best I know how I do trust You as my Saviour. I depend on You from this minute on for my salvation.